I don’t know about you, but if I didn’t have kitchen organizers my kitchen would be such a mess! I love these things, and I’ve been known to buy extras of my favorites. Being organized in the kitchen makes cooking so much more enjoyable, don’t you think? And easier too! Not only can you find exactly what you’re looking for instead of digging around in cabinet for it, but your recipes come together so much more quickly when you have the right tools in place. Roll out shelves – I really really love these! They fit inside your cabinet and roll out 3/4 of their length — so you can organize what is there and get to it quickly. Kitchen cabinet baskets – Under-cabinet baskets come in all shapes and sizes. Some sit directly on the shelf inside your cabinet. Others hang over the cabinet door itself. Some are 2- or 3-tier. Others hold tall/deep items. I like to use this one for dishcloths. Smart Spin for food storage containers & lids – If you’re tired of having all of your plastic containers and lids everywhere but where they belong, then you’ll love this! It’s a round caddy that spins, making it easy to access any container or lid. It comes with different sizes of plastic food storage containers and lids that all fit on the caddy itself. 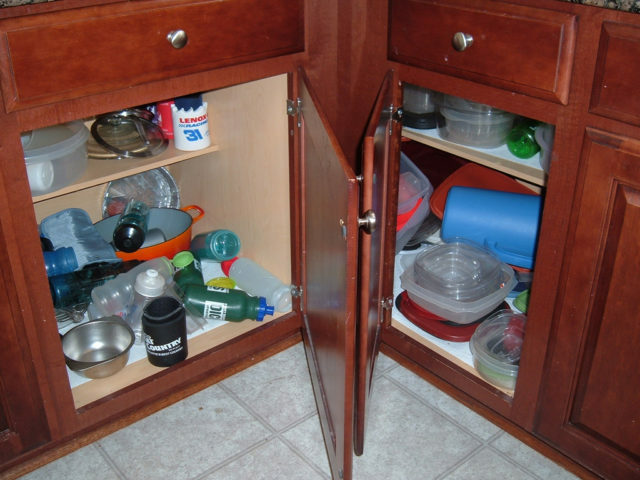 No longer do you have to take up precious cabinet space with all different sized storage containers! The whole thing takes up the same amount of space as a coffee maker. Can organizers – This one is brilliant! These vertical racks allow you to get more cans of food into your cabinet or pantry. It allows you to use more of the vertical space in your pantry or cabinet. Plus, you can see everything that’s in your cabinet instead of having to move cans around trying to see what’s in there. Holder for boxed rolls of paper – If you’ve ever tried to locate a roll of aluminum foil, plastic wrap, or wax paper in a crowded drawer, then you’ll appreciate this type of holder that’s been designed specifically to hold these types of rolls. You can get one that fits on the inside of your cabinet door, on your wall, or on the cabinet shelf itself. Either way, you’ll always know where your rolls of foil and such are. So there you have my personal favorites. Which are your favorite kitchen cabinet organizers?